Trader ID — Sets the routing trader ID to identify the user on all order actions. This value maps to user_id_s in the exchange API. 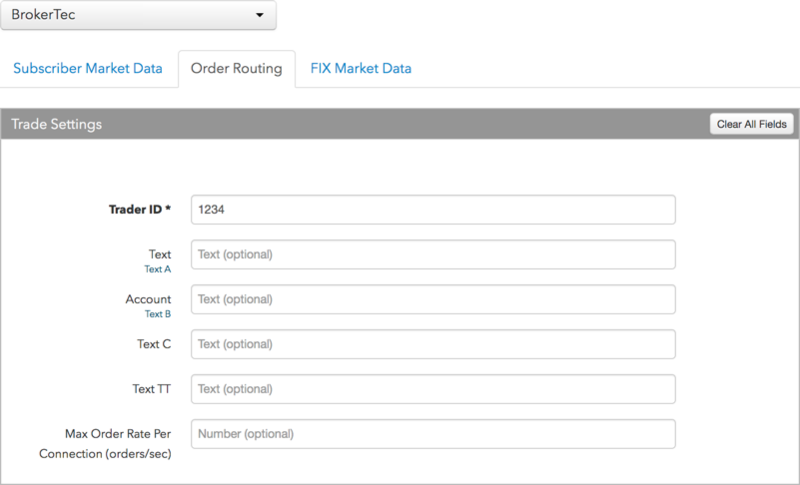 Enter the exchange-provided routing trader ID of up to 5 characters in this field. This field is required for order routing. Text — An optional, user-defined text value that remains on submitted orders in the TT system and is sent to the exchange in the exchange_info_s field. Enter up to 32 characters. Alpha-numeric and special characters are allowed. Account — An optional, user-defined text value that remains on submitted orders in the TT system and is sent to the exchange in the customer_info_s field. Enter up to 15 characters. Alpha-numeric and special characters are allowed.